I couldn’t sleep. 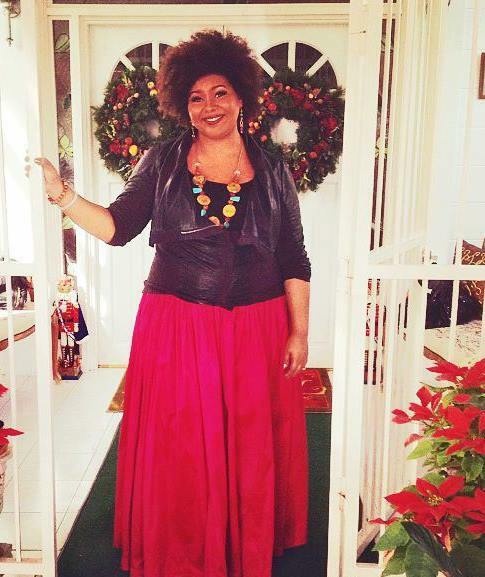 The night before my TEDx Port of Spain appearance, I was nervous to the point of nauseousness. I remember tossing and turning in my old bed, trying to fall asleep in my old childhood bedroom. I had written a speech, but the point was to practice it over and over again until it became a talk and just flowed naturally from my heart. I spent a few afternoons practicing with TEDx Port of Spain’s Keita Demming, working out the ebbs and flows, the natural pauses, the order of what I wanted to say. On the morning of 12/12/12. there was no more time to practice. I was first up on stage, opening that year’s event. I slipped on my Sofistafunk skirt and jewelry made for me by Linx by Mark Morton. I was as ready as I was going to be. My mom and my sister Petal came with me – my dad had to attend a funeral that morning. We snapped this photo as I left the house. I remember sitting in the front row, waiting to take the stage. My palms were sweaty. My feet were sweaty. I was so nervous. And here I was, about to get on stage in that world famous red circle, and speak before my family, friends, people who knew me throughout all the stages of my life, people who didn’t know me at all. I can honestly say it was one of the scariest things I’ve ever done. Looking out into the audience and seeing my mom, my sister, former teachers and classmates, old family friends, that one person I was talking about but didn’t think would be in the room whoops… it was a whole lot to process. Talking and sustaining an audience’s interest for 16 minutes is a lot. Heck, talking for 5 minutes is a lot. But I did it. My speech became a talk. And the response I’ve gotten from everyone who’s watched my TEDx talk has been amazing. I wrote about the experience at length here, so click to read. Reflecting on this a year later, I realize how much the experience did for me. Since giving that talk, I’ve made many appearances on stages at conferences and had to speak and share my wisdom and experience. I’ve done a few television appearances, too. I don’t get as nervous about that stuff anymore. I still get a little nervous, but I can control it because I know I can do anything I put my mind to. Delivering the TEDx talk lifted that heavy cape of fear from my shoulders. This is how I felt when it was OVER. Public speaking was one of my biggest fears. Facing it head on and conquering my fear has been liberating. Maybe you’ve got something like that in your life – something you’re just afraid to do for any number of reasons even though you know the reasons are stupid. You can do it. You can do anything. And when you’re done doing it, you will feel SO happy that you did. 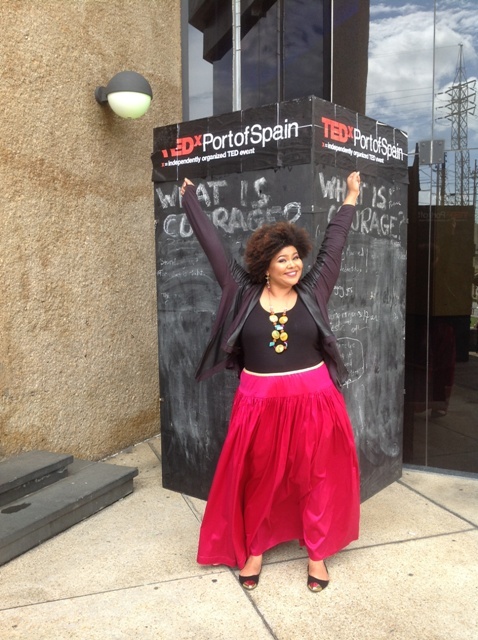 Thanks again to Keita, Denise and the TEDx Port of Spain organizers for believing in me and pushing me out of my comfort zone. I’m stronger for the experience. Yes I do remember your TEDXPOS speech last year and again am so proud to be your sister! Since then you have definitely become more savy about stage and tv appearances – you did the Iman and Gabrielle Union Essence collaboration in NY this year among many other events. I again congratulate TEDXPOS for its commitment and creativity and wish it many years of positive and exciting talks. Hope to see you and TEXDXPOS collaborate again. The TEDxPortofSpain team is just happy to partner and share ideas. Thank you for sharing your essence with us in T&T. Be Well!